Barbecue Master: Never Been to a Redneck Grill Party? You're Missing Out. Never Been to a Redneck Grill Party? You're Missing Out. Folks do things different in the South and that includes barbecuing. Actually barbecue is slow smoking pork, and grilling is putting anything else on the grill and cooking it. But, we done figured out that the rest of the country don't know no better. If women are involved in the barbecue party planning, there will be some decorating. If the flowers are not in bloom - no problem. That's what plastic flowers was made for. Other favorites are flags and mostly American and plastic yard birds are also pretty darn popular. Now, if guys are taking care of the details at the barbecue, you will not have decorations and maybe not napkins. That's what pants are made for. The best Southern grills are homemade. They are made out of all kinds of stuff, so recycling is alive and well below the Mason/Dixon as is dumpster diving. 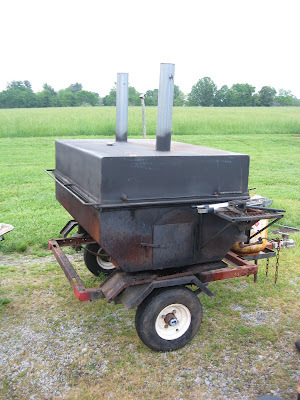 Most common of the homemade barbecue grills or barbecue smokers are ones made when your oil tanks go to leaking or if you come across a big old barrel that ain't good for much else. If you have to bring in a store bought grill down South, that's no problem. Most everybody has a pick up or a relative with one. 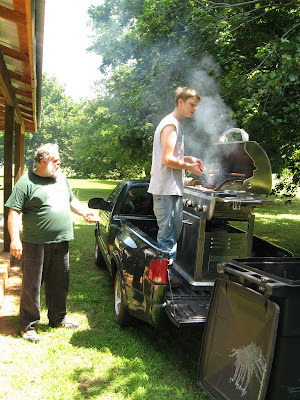 But, some Southern men figure it's too much trouble to unload the grill, so they just fire up in the bed of the truck. This is not FDA approved or recommended but no casualties have been reported to date. The older guys will, if they get a chance, supervise at the barbecue. After all, they done their dues. Old fellows, however, are not content to go plop down in a lawn chair. Oh no. They figure they better offer up some advice so end up spending as much time supervisiing as they would have grilling. It's just a guy thing I guess. Tell a woman not to worry about cooking, and she mostly won't unless something catches fire (also known as "afar). The longer a redneck barbecue lasts the more fun is had and the better (or worse) the dancing gets. In fact, a redneck party can last until the cows come home at which time they have to be milked, of course, as things like that just can't be put off to another day. 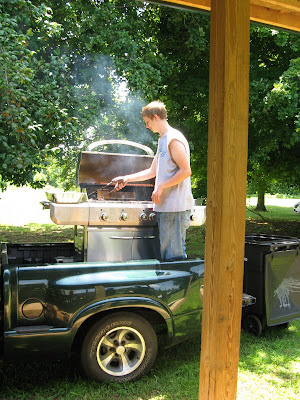 If you are not sure if you throw redneck barbecue parties, check out Are You a Redneck Grill Guy or Grill Girl at Yes! You Can Grill. Of course, you probably already know, but it's still fun to peek, and you can email in your other redneck party notes if you like.